Donen wasn’t confident with the script, which was constantly being rewritten, so he made up for it with unusual and experimental shots that add to the movie’s unique aesthetic. “Our only hope is to make it so visually exciting the audience will never have time to work out what the hell is going on,” Donen reportedly told Christopher Challis, who directed the film’s BAFTA-winning cinematography. Thus, like The Thomas Crown Affair (1968) to follow, a relatively ordinary plot was spiced up for the screen by clever cinematography and an emphasis on style. We meet our Hitchcockian hero, Professor David Pollock (Gregory Peck), as he’s teaching an admittedly dry hieroglyphics classic on behalf of the missing Professor Ragheeb (George Coulouris). After his lecture, Pollock is cornered by Sloane (John Merivale), a sinister Brit who murdered Ragheeb in the opening scene, who asks to speak with him. “Well, if it’s about that small outstanding bill at the bookstore, there’s a simple explanation… poverty,” Pollock drolly responds. At Sloane’s urging and the suggestion of the prime minister of an unrevealed Middle Eastern country, Pollock reconsiders his initial stubbornness and finds himself taking a meeting with the disturbingly suave shipping magnate Nejim Beshraavi (a disturbingly Mancunian Alan Badel), who asks him to consult on an inscription… the very one that Sloane had earlier obtained during Ragheeb’s murder. 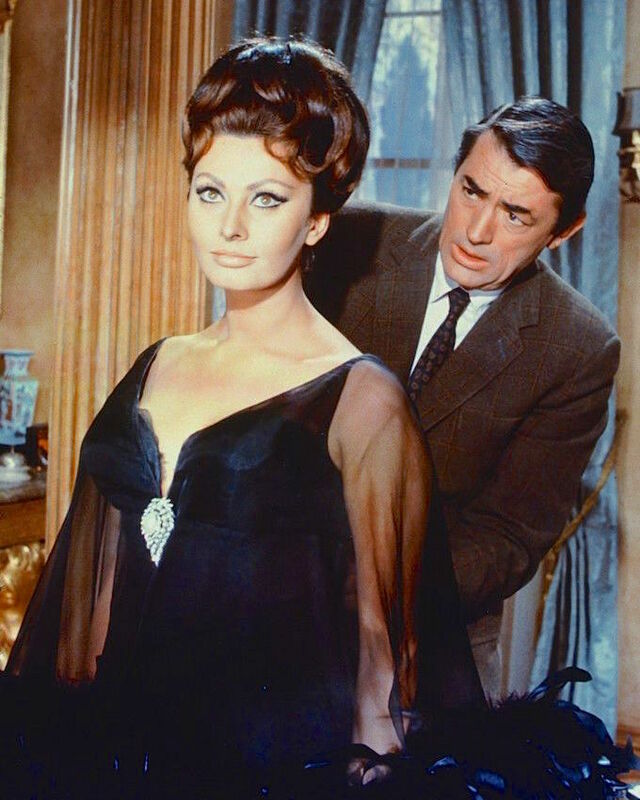 While a guest in Beshraavi’s home, Professor Pollock encounters the striking Yasmin Azir (Sophia Loren), who requests that he help her with her dress. Pollock: I always tremble when I’m happy. Over dinner with a jealous and possessive Beshraavi, Yasmin uses a clumsy spill as an opportunity to slip a cryptic note into Pollock’s hand. Unfortunately, Pollock is no 007, and our inexperienced hero accidentally drops the note into his honey and is forced to cover for the slip by claiming it’s a prescription for indigestion (as he tries to digest so many dry books as a professor.) He soon picks up a spy trick or two, however, and tries to flush the note away before covertly meeting the lovely Miss Azir in her room at the top of the stairs. Fun with Gregory Peck and Sophia Loren on the set of Arabesque (1966). Note that Peck has evidently changed out of his character’s brown suede derby shoes and into a pair of black-and-white sneakers. He gets even further than that when Beshraavi stops by, forcing him to hide in the shower. Of course, Beshraavi insists that Yasmin not delay her shower on his account… and she steps into the shower with a fully clothed and rather befuddled Pollock standing behind her. He’d complain, but who’d listen? The twists and turns are just beginning, as David and Yasmin next stage an escape from the home in the form of a faux kidnapping that leads Beshraavi’s henchmen to chase the couple to the zoo, where he ends up taken captive yet again – this time by Yasmin and her mod pals who leave him drugged up and mock-bullfighting on the side of the highway. 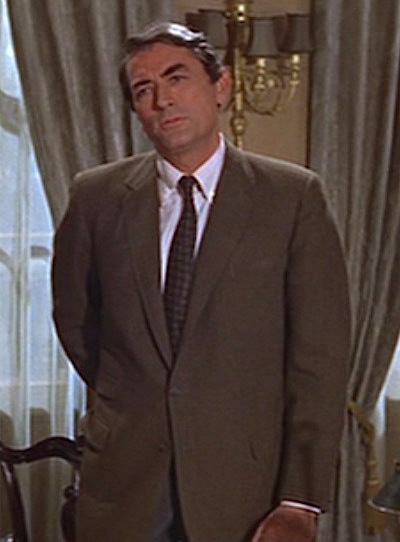 Gregory Peck had been a client of the venerable Savile Row tailor H. Huntsman & Sons for more than a dozen years by the actor took on the role of David Pollock in Arabesque in 1966. The role of an American professor teaching at Oxford provided the perfect opportunity for Peck to show off his impeccably tailored English clothing on screen, beginning with a brown windowpane sport jacket and odd trousers worn for the first half of the movie. Peck wears a brown flannel sport jacket with a two-color windowpane check in subdued rust and black. The jacket nicely fits his professorial character, though the soft napped flannel cloth would be more appropriate in the country than an evening in London. Tailored by Huntsman, Peck’s single-breasted jacket features many elements of the traditional English style, including natural shoulders, notch lapels of moderate width that roll to a two-button front, double vents, and flapped hip pockets with a flapped ticket pocket on the right side. Professor Pollock takes in the elegance of Yasmin’s lavatory. The countrified jacket has unique suede elbow patches in a half-oval shape that only covers the back half of each elbow. Each sleeve has two spaced buttons at the cuff. Despite the arguably English cut of his jacket, Peck’s oxford cloth button-down shirt enjoys a more American association dating back to the waning years of the 19th century when John E. Brooks was inspired by English polo players’ practice of attaching buttons to their shirt collars to keep them from flopping around during matches. Made by the venerable Frank Foster of London (as confirmed by the shirtmaker’s Instagram page), Peck’s shirt is a pale eggshell cotton, a shade warmer than plain white for stronger harmony with his earthy jacket and tie. The shirt has a spread button-down collar, breast pocket, and single-button rounded cuffs. David’s shirt – and his dignity – are somewhat worse for wear after an unusual Wednesday. Peck’s tie consists of a repeating field of rust-and-green paisley teardrop-shaped patterns on a black ground, creating a rustic-toned effect that nicely coordinates with the brown windowpane jacket. Pollock and Yasmin stage their escape from Beshraavi’s home. Peck was a master of the venerable and versatile gray flannel trousers. By the mid-1960s, pleats and turn-ups were growing démodé among the fashionable set, but Peck – with his timeless sensibilities regarding traditional menswear – dressed in Arabesque with a pair of dark gray flannel trousers styled with double forward pleats and cuffed bottoms. With this outfit and his brown flannel suit worn at the film’s climax, Peck’s David Pollock wears a burgundy belt in exotic scaled leather with a squared gold single-prong buckle. Pollock sleeps off a rough night. In Dressing the Man, Alan Flusser writes of the suede shoe’s initial difficulty in securing a foothold – if you’ll forgive the pun – on men’s feet. The men’s suede shoe made its inauspicious debut on the feet of the Prince of Wales (who else?) when Edward VIII sported a pair of brown buckskin lace-ups with his gray flannel suit at the 1924 International Polo match at Long Island’s Meadowbrook Country Club. “Though the sovereign-to-be’s sartorial proclivities were already legend on both sides of the Atlantic, fashion observers were aghast at his supposed breach of good taste in sporting ‘reverse calf’ (as suede was then termed) oxfords, with a suit, no less,” describes Flusser. Flusser including the detail of the timeless ensemble of a brown tweed jacket, gray flannel trousers, and brown buckskin shoes recalls Gregory Peck’s kit throughout the first half of Arabesque, at least until the good professor finds himself sharing a shower with Sophia Loren… a fine situation for anyone, to be sure, though not promising for the longevity of his footwear. Peck’s David Pollock wears a pair of dark brown suede derby shoes with charcoal wool socks… hardly ideal for a shower, no matter who else may be joining. Much is said about how the color of hosiery should complement its surroundings (preferably to match the trousers), but less reported is the importance of choosing socks that connect with the texture of the rest of the outfit. The great Flusser said it most effectively: “for the sock to effect a stylish transition between trouser and shoe, it must share some of their physical properties.” Peck masters this transition with his chunky charcoal ribbed wool socks that both continue the leg line of his dark gray trousers while also linking the coarser texture of his flannel jacket and trousers and his suede shoes. Professor Pollock’s gold watch is never seen as clearly as the sinister Major Sloane’s Everite 21-jewel timepiece, though the details of its silver dial and russet brown leather strap are visible on screen. A ringing phone can be a hangover’s worst enemy. If I could find my head, I’d go get it examined. Gregory Peck who had a voice like earthquake aftershocks and who was the basis for Bruce Wayne’s appearance. And you thought being Atticus Finch was BAMF enough. A first-class outfit for a great star who could be very elegant when the role called for it. Hmmm…a tweedy professor who gets dragged into intrigue and danger. Why is that familiar to me? For what it’s worth, I think the filmmakers were offering a comment on the Vietnam war in the final sequence. The well-armed killers would have made very short work of Peck and Loren if they hadn’t chosen to chase them about in a helicopter.